This amazing bat featured no less than 13 Australian Test captains – Six members of The Invincibles and Australia’s three highest Test run-scorers. 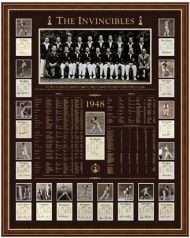 Integrates an officially licensed bat along with a Don Bradman signature card obtained with thanks from The Bradman Foundation, along with four signature cards commemorating the most memorable performances in the 21st century. Artwork integrates action imagery of each signatory along with details and an account of their most memorable Ashes contribution.